There are many different types of front doors. Your front door doesn’t have to look like everybody else’s front door. 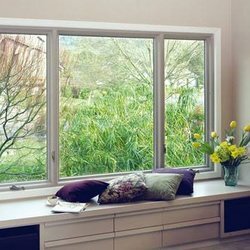 In fact, there is such a wide variety of types out there, you may find it difficult to narrow them down to the front door that’s right for you. 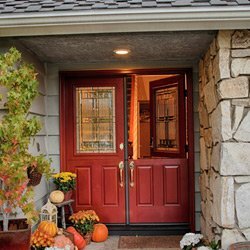 When discussing the different types of front doors, you need to consider two different things. Material – The actual material the door consists of. Each type brings its own advantages and looks. Style – There are quite a few different ways a door can look independent of the material it consists of. Your exterior door can consist of three basic materials. The material of your door is an important consideration. But it all depends on what kind of performance and maintenance you expect out of your front door. Wood – Wood doors are probably the most common kind of door out there. They can fulfill almost every need. They range from the absurdly expensive to the ridiculously cheap. Depending on the wood (or composite) used to make the door; they can work well for security purposes. Designs are virtually unlimited. A downside is that it’s wood. That means it can warp, shrink, and swell over time. However, a good, sturdy wood door can last a long time. All it requires is some occasional maintenance to remove scratches. They can be stained, repainted, and refinished. Steel – Steel doors a good option for the security conscious. They also offer some energy efficiency as well, according to the Department of Energy. They are durable and can stand up to any kind of weather. They don’t have to look like steel doors if you don’t want them to. You can paint them and have them custom designed as well. Unfortunately, if for some reason your door becomes dented, it’s not as easy as other types of doors to remove the blemish. Fiberglass – Fiberglass doors attempt to offer the best of both wood and steel. Fiberglass doors often offer the energy efficiency of steel doors, but with a look that’s closer to wood. They’re durable and can last a long time. While they offer some security, they’re not as secure as a steel door, or a heavy wooden door. There are other materials besides, such as aluminum, vinyl, and various composites. Each material offers benefits but it’s up to you to choose which will work best for you. As far as budget goes, wood doors are typically the cheapest, steel the most expensive, and fiberglass is somewhere between. Understand that this can vary widely depending on the features of the individual door. Separate from the material is the style of front door you want. Different types of front doors exist for almost any kind of aesthetic preference. In addition, you can also have a custom design. 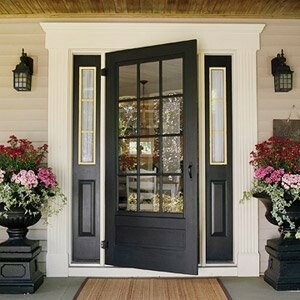 But the most common types of front doors include the following. Single doors – These are the doors you’re likely most familiar with. They can open from the left or right, and they can come in any style you can dream of. Double doors – Double doors, or French doors are two doors instead of one. They typically open from the center. Dutch doors – These are the types of doors that allow you to open the top half independently of the bottom. Security doors – Security doors are made of steel, but not all steel doors are security doors specifically. Security doors are usually advertised as such. They use a heavier gauge steel, but they still can come in pleasing designs. Even with all the different types of front doors, it’s important to remember that you don’t have to go with just one thing. There are many doors that use a combination of materials, such as steel doors that have a composite wood facade, or wood doors with steel cores. The truth is, your only real limit when it comes to front doors is your budget and your imagination. You can have a practical door that serves a simple purpose while still offering excellent security. You can have an amazingly ornate and artistic door that does more than just look nice. There are different types of front doors; you just need to find the one that’s right for you.